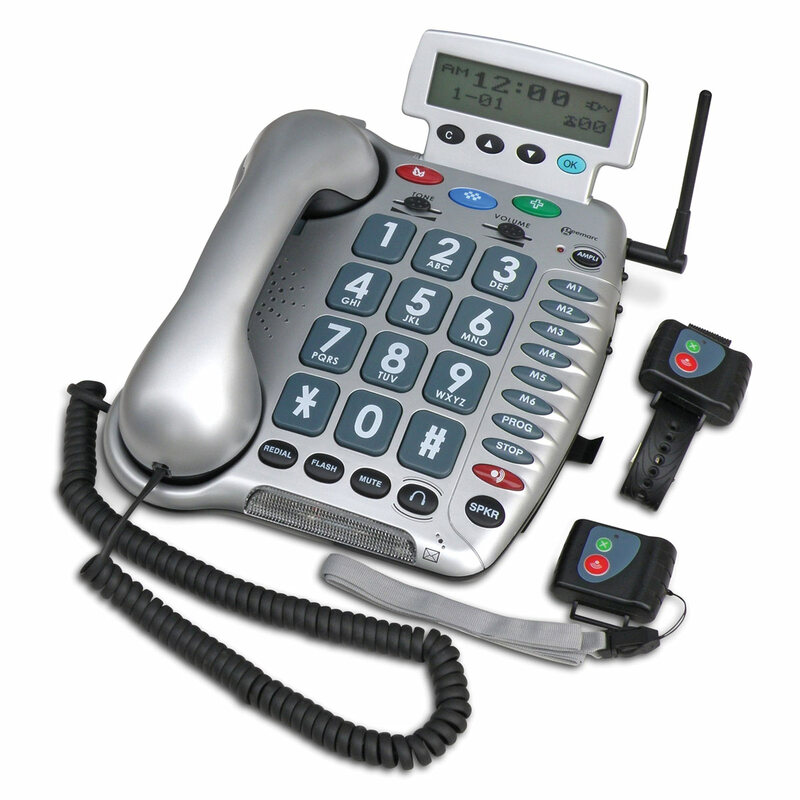 "Help is Only a Button Away"
The Amplified Emergency Connect (AEC) Phone is an amplified phone with Caller ID, speakerphone and emergency connect features all in one unit. The emergency connect feature gives you the peace of mind of a security service, with no monthly monitoring fees. How does the emergency feature work? The AEC becomes an automatic dialer in emergency situations. It comes with a small transmitter remote that can be worn on the wrist like a watch, or attached to a neck lanyard (included). In the event of an emergency, the wearer presses the emergency button on the transmitter or phone. Once the emergency button is pressed, the phone numbers of up to six preprogrammed emergency contacts are dialed. These are normally family members, friends or neighbors who would be able to respond to the emergency call. If there is no response after 30 seconds or the line is busy, the phone automatically dials the next preprogrammed phone number. It will cycle through the emergency numbers twice. When the phone reaches a live person, it will play your pre-recorded emergency message. The other person will dial a number (0-9) to confirm that the emergency message has been received and to deactivate the phone from dialing the next emergency contact number. The AEC then turns on its speakerphone so that the emergency contact is able to speak and listen to the other user, known as Remote Audio Monitoring. The AEC Phone comes with a One year warranty.